Andrew Roundtree – 1st Lylehill Company in Northern Ireland. On the 20th November 2016, David Blevins, Brigade Vice President, presented Andrew Roundtree with his President’s Commendation. Andrew is six years old and has undergone two major operations, only eight weeks apart. This has resulted in his immune system being reduced which has left him at greater risk of infections. He is the first boy through the door for the BB meetings each week and loves his time with his friends. He participates in all activities to the point that sometimes his enthusiasm has to be curtailed in order to keep him safe. 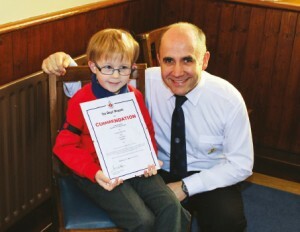 Samuel Jameson, Captain, says Andrew is a delight to work with and he has observed him helping some of the younger boys. Andrew’s positive, cheerful attitude and enthusiasm is an inspiration to all who know him.